Mercurius Creative Blog: Get a good, custom made website for cheap! Get a good, custom made website for cheap! Mercurius Creative is an experienced web design company based in Phoenix, Arizona with a global vision. Our skilled website developers are capable of building various types of sites including traditional business sites, Wordpress sites, Joomla sites and other dynamic sites. A professional website gives you the resources you need to represent your business on the internet. Web pages are the business cards of the 21st century. This is a basic starter site for those who need to get online quick and are on a restrictive budget. This is a professional website which gives you all the space you need to communicate with your visitors. Plenty of information and extra SEO work will help gain high exposure and high results! 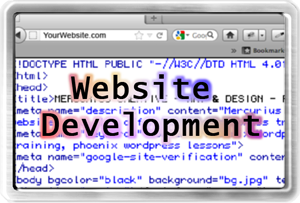 Learn more on our Web Development & Design page.